Another great stay at Big Fish Las Palmas. Great chilled out living room and really helpful staff who care about you enjoying Las Palmas and the island. Dorm was nice, clean and plenty of bathrooms. Location is awesome, some great bars on the same street and a stones throw from an awesome beach, which you can see from the terrace. Thanks everyone, I’ll definitely be back. Loved this hostel! had an great view of the ocean from our room, and it surpassed our expectations! Very clean, lovely staff and great distance to a grocery store and the beach! Lovely staff, very helpful and relaxed. Made us feel very welcome. Very good location for the beach, markets, Santa Catalina, buses etc. Our private room had it's own balcony! It doesn't get much better than this. Thank you very much for a pleasant stay at the hotel. The staff was nice and helpful in everything. The hotel was clean and quiet and the location is just a minute from the beach. Thank you for everything. My stay at Big Fish was the most fun I've ever had staying at a hostel and one of the best travel experiences I've had in a couple of years! The staff were so incredibly welcoming and the other guests were fun, exciting unique individuals that I'm so glad I got to meet. The facilities are comfortable and the hostel is impeccably clean, which is amazing considering how hard it can be to keep a place at the beach clean. I would 100% stay here again. 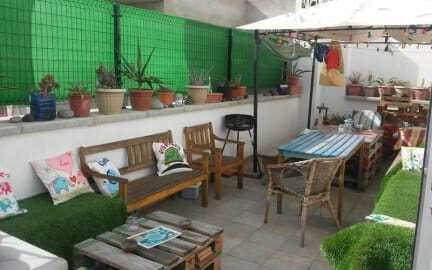 The location is amazing, two bathrooms in public areas but very clean and roof terrace and drinking water on tap.